Has anybody else had a crazy year? Some days, I’m not sure whether I’m coming or going, and some days I can’t tell up from down. Despite all that, it’s been a good year. God is good, and His faithfulness amazes me. All. The. Time. Last month, I shared the opening scene from Bella Notte with you. This time I’ll share part of the story behind one of the book’s scenes. You may know this already, but my name is Heather. My grandmother once bought me some heather potpourri. Sadly, I was allergic to it. 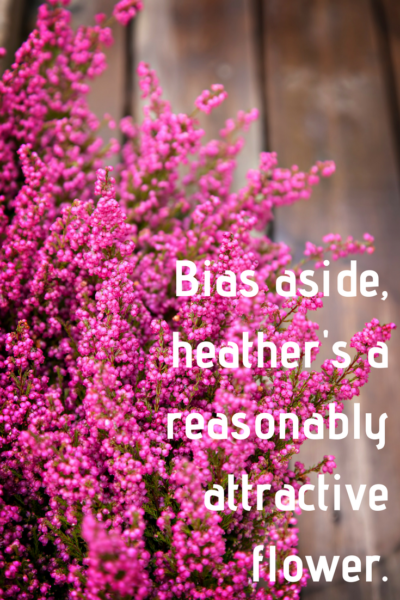 Flowers and I don’t generally get along, so it shouldn’t have been a huge surprise, but…it was heather. I was supposed to love it, not feel like my entire face was on fire. In any event, as I grew up, I often heard about the flower heather and how it was the national flower of Scotland. I may not have loved the flower, but I liked feeling special. Being a national flower was pretty cool. Then I wrote Bella Notte. How could I not work the whole heather-is-the-national-flower-of-Scotland thing into the story? After forty years of believing heather was Scotland’s national flower, you can imagine my shock when I learned that the national flower is actually thistle. That’s what Eeyore eats. It’s all thorny and unfriendly and not remotely romantic. As you read Bella Notte, I hope you’ll laugh with me at some of the characters’ adventures. 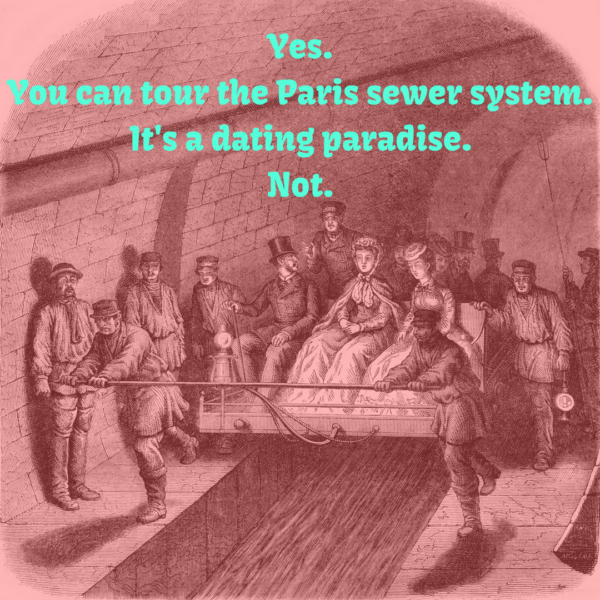 From the moors of Scotland to the sewers of Paris, there’s not a dull moment as they discover their feelings for each other and some of the lessons God has for them. The model managed to snort without moving a single facial muscle. 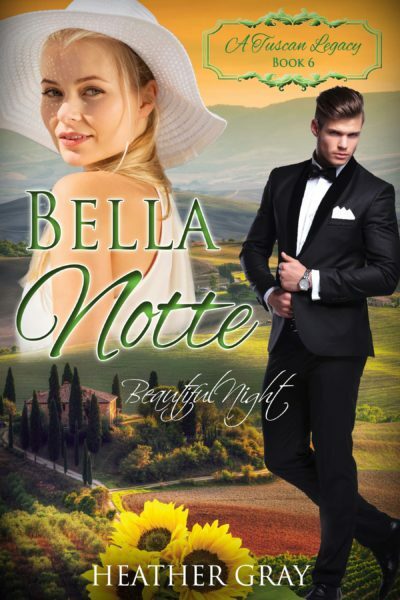 Two commenters will be randomly selected to receive an e-book copy of Bella Notte. The winners will be announced in the upcoming Sunday Edition. Hi Heather! Enjoyed your book. Not sure if in my travels I visited many bizarre tourist attractions, since I enjoy visiting parks, gardens, museums, churches and historical sites! Michigan has a Mystery Spot. In Southern Indiana we took our youngest son to a buffalo farm. In Germany I climbed the tallest spire in the world – Ulmer Münster – 768 stairs up and 768 winding stairs down. The Ulm Cathedral is not the largest but it is the tallest. While living in Chicago often went up the Sears Tower , the tallest skyscraper with 110 stories at the time. Elevators make the ascent easier. Best wishes! Interesting topic. Reading the remarks about thistle are interesting. My German mom had them on her East Prussian farm and called them “burning thistles.” I never understood until my trip to Berlin in 1996. I was in East Berlin at the Topography of Terror, an exhibit about the Stazi. It was across the street from the Stanzi, East Berlin secret police that kept volumes on their citizens, who opposed the government. All of a sudden my calf began to burn. I had brushed against “a burning thistle.” When I told my East Berlin relatives, they loved the plant. During the Cold War, there were few over the counter remedies and lots of products were rationed. Burning Thistle helped with arthritis. The leaves could be made into shampoo. If I remember correctly Burning Thistle leaves also made tea. When one reads Early American midwives, they also knew Herbal Medicine. Like the interesting notes. Wow! You’ve visited so many interesting placed! And the burning thistle sounds…unpleasant. Ugh. It’s always fascinating to me how so many modern medicines are synthesized versions of natural herbs. 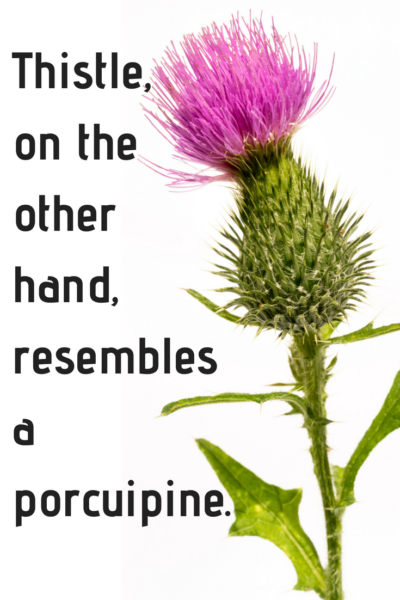 So thistle is Scotland’s national flower. I did not know that. I can remember when I was young, my mother picked a thistle bloom and put it in a vase on the kitchen table. My dad, a Kentucky tobacco farmer, came back to the house and had a conniption fit. He had fought thistles in the fields all his life and couldn’t believe mom had brought one in the house. Years later, dad is 93 and retired. He occasionally buys thistle seed for his bird feeders. I’ve never mentioned the scene he made that day, but chuckle about it to myself. I share this story because the only bizarre tourist attraction I can think of is an outhouse in an anonymous state park. It had been vandalized prior to my visit. I desperately needed the visit but quickly decided I was not that desperate! While not unusual we had fun with my mother visiting the beginning of the Appalachian trail head in Georgia, shortly before she passed away. She was worried about my youngest ,Becky, at age 5 keeping up with us. Becky ran up the steep trail and then led us back down and then played in the playground near the parking lot. The rest of us watched her play while I asked my mom why she was worried about Becky keeping up. I’m reading your book right now and I love it! I’ve not been able to read much because I have an editing client, but when I can I LOVE IT! My husband and I used to do wedding photography, so it’s fun to relate to the book. As for the strangest place we have visited, well it would be in Arizona. Please save your money unless you’re really wanting to see this. It’s so strange!! It’s called the Mystery Castle. It was made out of WIERD stuff all by one man. Look it up it’s STRANGE! Thistles are scary, but the color of the bloom is my favorite color. It used to be a crayola color and mine was always broken. Does an outhouse count? There’s a historical plantation in Arkansas close to where I live. It has an old school house and several buildings including an outhouse. I had a book signing at a festival there once and they put me by the outhouse. I got a lot of traffic and sold a lot of books because so many people had never seen a real live outhouse. What a hoot! So, when you’re in a restaurant, nobody wants to be seated by the bathrooms. At a book-signing, though, it’s the way to go! Thank you for the chuckle! Excellent point! Prickly with a touch of pretty. Or vice versa. I can’t really think of anything bizarre that I’ve visited (I have been to Scotland though and I didn’t know that thistle was their national flower), but I’m looking forward to Felicity’s story. I can’t think of anything bizarre. Thank you for sharing. I’m glad you could stop by today, Lucy! I think there is a wax museum by Niagara Falls that we visited many years ago. Strange. And weirdly fascinating at the same time. Most unusual attraction I’ve visited probably was the Invisible Exhibition in Budapest where for an hour you experience life as a blind person. Hahahaha! You made me chuckle. Good job! ^_^ I lived in the Reno area for part of my childhood, and we would often go to San Francisco when we had a three-day weekend or something like that. I’ve been across the Golden Gate Bridge a few times. Every single time was captivating. The bridge is impressive in photos, but seeing it up close and personal is something else altogether. Of course, I was also a child, so everything seemed so much bigger to me. Crossing the bridge may have been my favorite part of those weekends! I don’t know about bizarre, but Wonder works in Orlando, Fl is an upsidedown house.Coulf not find pictures ! Neat! I found a picture, but the url for it is really long. How cool is that!? I love some people’s imaginations! Thank you for sharing! I haven’t travelled that much, so I haven’t seen that much. I guess as I was only 5 the dinosaur in the museum in Pittsburg. Can;t remember the museum’s name. Scared the stuffings out of me. I didn’t take into consideration how big it would be and to a 5 year old it was pretty big. It wasn’t a TRex but I think a brontosaurus. Anyway, I had loved dinos until that time. We have some unusual tourist attractions in Australia – The Big Banana, The Big Pineapple (although this one has now closed, but the structure is still there), The Big Merino – you can actually go inside it and look at the view through the rams eyes! I’ve seen all three, but the only one I’ve actually been inside is the Big Pineapple. An ice cave in Austria. There were a lot of steps and I kept getting out of breath. Those Europeans are sure fit. I also went to Israel and saw a lot of amazing places and walked through some tunnels.